Reviews | Choice Gray Utility / Bussing Cart with Three Shelves - 32" x 16"
Choice Gray Utility / Bussing Cart with Three Shelves - 32" x 16"
Perfect for restaurants, hotels, janitorial staff, caterers, and more, this Choice 32" x 16" x 38" blue gray three shelf utility / bussing cart is a reliable way to transport a wide array of items from full bus tubs to janitorial supplies. The durable plastic shelves hold a combined total of up to 350 lb., and dual molded handles aid in pushing or pulling the unit from either side. Use this cart to hold several bus tubs to sort dirty flatware and china on your way to the dishroom, or fill it up with housekeeping supplies for your motel. However you choose to utilize this plastic cart, you can count on the Choice brand for economy, reliability, and durability. Four, 4" swivel casters are included with this cart (two with brakes) so that you can maneuver around furniture and corners with ease. Great cart, wheels are sturdy and rotate easily. Shelf uplifts contain shelf contents when rolling to avoid tipping. Perfect space in between shelves, allows to fit all containers. I love these carts! Light weight but also very sturdy. They don’t make a lot of sound while you roll them around either. I use them for many things! Smaller than the other options, this cart works better for tight spots and getting tables cleared. Stickers stay on if you decide to label them! We purchased this cart because of the price but we had no idea how much we could come to depend on it. We use it fir everything from transporting food containers to a temporary prep station. It was easy to assemble. Absolutely love this cart! My employees have asked for one for quite a while now and I finally gave. It was a really good investment and has been put to great use. I will be purchasing another one in the future. Highly recommend for the money! We order this item for our small kitchen. And found out its little bigger than what we expected. But, overall its still good cart for a small kitchen. Works great! Really easy to push even with a few hundred pounds on it. It's the perfect size for transporting our items to the other side of the warehouse once they're packaged and ready to be shipped. one of the best carts i have ever recieved in my restaurant and we buy from everywhere. it was the cheapest and the best quality. Very affordable, rolls easily, and is lightweight enough for one person to easily lift into a van. Perfect for our catering events, I will be buying more. 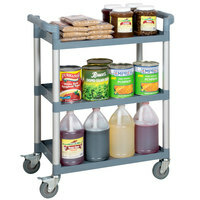 These carts are great for use in a kitchen or a dining area. Very sturdy and easy to maneuver. Great price and not too big and bulky in size. This cart was easy to assembly. WE have enjoyed using it. We had looked at some at other stores but this one was much cheaper. It is very sturdy. Nice simple cart, very easy to use and assemble. The pieces fit together well so there is no possibility of falling apart and the wheels move and lock nicely. Great buy especially for the price. This cart is good quality and has a lot of uses. It is very versatile! We use ours for tasting glasses at the brewery! We actually ended up buying a second one! Really great utility cart! We will be buying more. A word of caution, whoever puts it together tell them to make sure everything is pushed together tightly before starting the next level otherwise you will end up with an unsightly cart. Very sturdy and well build. Holds 100's of pounds at once. Great buy at a great price! Convenient, reliable and useful are three words I use to describe these bussing carts. I own several and the only reason I would buy another would be if I wear one out. They are so useful and helpful around the restaurant. We have this same cart in black and had to order this one to distinguish which department it belongs to. It's a great product and the other 2 we have have held up very well. Great price and just as durable and well made as cart's I priced at triple the cost. I use several different brands at work so I was able to compare them. This cart is very handy all around my store. I have purchased this brand and style cart in black and really like it. I needed more carts and was going to purchase two gray carts. When they arrived they are BLUE and not gray. The blue is very pretty but if you are looking for a gray cart, it is not this one. Has come in handy during all parts of the day. From moving heavy prep work in the morning to shuffling dishes to kitchen after cleaning. Sturdy and easy to clean. love the cart! good quality for the price and love the fact that it has a locking wheel too! would highly recommend for those that run a food business. Very handy. We use this cart to put are containers for the line on. We can quickly put them into the salad bar or the hot well and it works perfectly. These carts are a great bargain, are simple to put together, easy to clean, and roll nicely. The wheel brakes are a nice function to have too. I use this cart everyday for moving things around my shop. It has transported more than 100 lbs on top rack with no problems. The wheels look but I've never used this feature. This is just what I needed to assist my employees during our on and off site catering events. Nice size shelves and it was easy to put together. I will order more when needed. Nice job, guys! Good sturdy cart, I like it because it is smaller so I can put it to the side without it taking up so much room. This is a PERFECT cart for me. Easy to put together (took a little elbow grease to hammer the rods in, but boy, it creates a wonderfully sturdy product). Still shocked at this price for this item. Perfect for my home based food production business. Thank you for your review, Allison. We are sorry this shelf broke for you. A Customer Solutions Representative will contact you directly. Simply but Amazing at the same time. The Choice 3 shelf utility cart can definitely handle the work load. The wheels are sturdy and smooth taking items from one place to another I will be purchasing more. Great little utility cart. Assembles extremely easily. Good quality at a tremendous savings over other brand name carts of the exact same design. Choice brand is really a money saver on Webstaurant. This cart does the job well especially for the price point, which can't be beat. Similar carts go for 3x the price! It is sturdy, the wheels move and lock well, and it holds a lot of weight. One thing to note is that while it is easy to assemble, it does require some arm-power to get the poles hammered down in place (at least it did for me). Great little cart! Somewhat difficult to put together, but once we got it together works great. All around great little cart to have in the kitchen. Easy to assemble, lightweight yet durable. Easily manueverable; holds many different items; lip prevents items from falling off. Cleans easy. Larger size excellent for those off-sized items or multiple big plates. We purchased this cart to load our coffee supplies on (coffee packs, tea, sugar packets, stirrers, creamer,, etc) so we could stock all of the kitchenettes throughout our offices (we have 7). It works great and could handle much more weight than we're putting on it. It pushes smoothly and quietly is a great size for navigating through various size hallways. Delivery was very fast and assembly was easy. We're very happy with this purchase. This item is great for partying and everyday use, as we tote food, dishes, cutlery, etc. into different rooms and the convenience of this item is phenomenal. This saves lots of time and it is a great item to own. The price is right, and the item is right! I highly recommend these bus carts. I use 3 of them in my ice cream business and they last forever as long as you don't stacks them constantly over 100-150 pounds worth of items.